Intrepid Gastro Bar @Far East Square (Singapore) | Get Your Grub On! I had read about ‘Intrepid’ on other blogs and friend’s facebook posts and since then couldn’t get those ‘Kangaroo Sliders‘ out of my head. So when my friend asked me what my plans for dinner were I made this a suggestion and so we went. We had a bit of a hard time finding the place as it didn’t have a big sign yet but when you find the Water Gate of Far East Square and look very closely it’s exactly next to it. 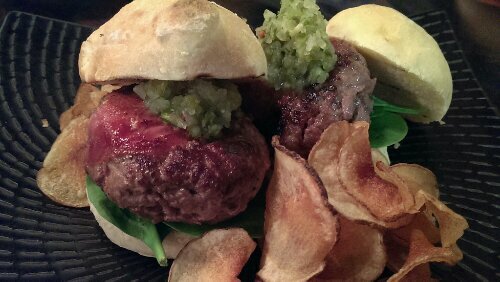 Naturally we started with the famous ‘Kangaroo Sliders‘ and they looked pretty darn good coming out of the kitchen. As kangaroo meat gets tough and dry very fast they broiled it to a medium rare. I usually prefer my burgers medium to medium well but the meat was of such good quality that medium rare was perfect and kept the patty moist and juicy. It was lean and had this distinct venison like flavor lifted up a level by the saltiness of the prosciutto that was “melted” on top. The bun was lovely fluffy and the host told us that they are making them from scratch freshly every day just for this dish as well as the crispy chips which maybe could have used a pinch more salt. As seconds I ordered the ‘Pork Sausage‘ which seemed to be some sort of special as it was off the usual menu. 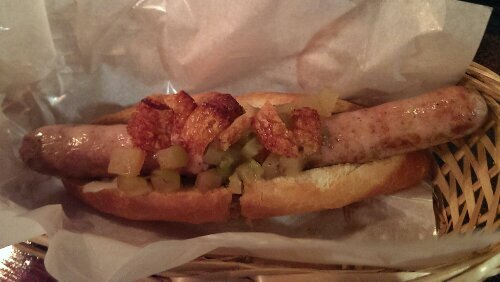 The “dog” came in a proper baguette bun, not that usual soft mushy stuff and the sausage had a great snappy casing, the meat was firm, well seasoned and tasted nice and porky. I found the sprinkled crackling on top was a great idea but maybe would have been even better if it was roasted instead of fried. The most delicate and special bits here though were the thinly sliced fennel slices that unfortunately were a bit overpowered by the sausage and the cubes of baked apple that had a fantastic sweet cinnamon flavor. 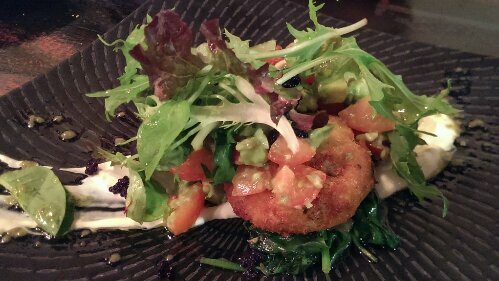 Recently we always seem to order beyond that hunger feeling and this time it was the ‘Crab Cakes‘. They were fully packed of sweet crab meat with a super crispy crust in which was a tad too much frying oil left. The cakes were accompanied by a salad of mixed leaves, tomato, creamy avocado as well as black and salty caviar that popped nicely in my mouth and tasted like little drops of sea. I quite liked it here with the Aussi twist they took on the dishes and the very friendly and kind staff so I might be coming back to try their ‘Kangaroo Loin‘ and the brunch items. Thanks guys!